Hello Amy! I recently discovered your fabulous blog. I was very interested in the ruler toe. I have a Janome 7700 and love doing free motion but am always looking for ways to improve straight lines and this toe and the ruler look like they will do the trick! Thank you so much for sharing! I've got lots of quilt tops just waiting to be quilted (once they are sandwiched)! Why, thank you! Sounds like you'll love ruler work. The fancy Janome is way out of my budget, $12,000.O0. The Passport from Pfaff is just a sewing machine with 70 stitches and retails for $599.O0, I am looking at it cause it does sew beautiful. I don't have anything to do with any sewing machine company, just trying to enjoy quilting and sewing. I agree, there is an amazing and often frustrating range of machines out there for us to choose from. Especially as the machines with more space to the right of the needle also usually have extra bells and whistles that we don’t need for free motion. That MC15000 is way out of my budget also, but is a pretty impressive machine. I am interested in the MC8200 as it is the lowest priced Janome that still has 11 inches of throat. 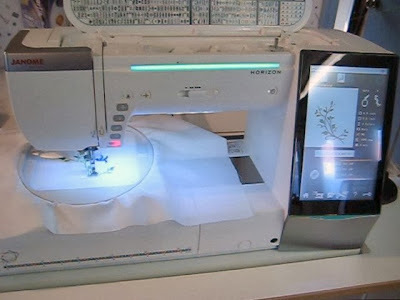 That being said, the reason why you’ll find no official prices on the internet for the big, new machines is because Janome dealers are able to set their own prices, but the company doesn’t want to encourage bargain hunting that will cause people to buy from across the country and then want services (oftentimes free) from their local dealer. I keep telling folks that I wish sewing machine companies would make a straight stitch only machine with good visibility and 11 (or more) inches to the right of the needle with a decent price (around $700) especially for the needs of free motion quilters. I think they’d sell like hotcakes! Now if only the manufacturers would listen to me!